Shapewear can be great for helping smooth out your curves and to flatter any figure. Unfortunately, much of the shapewear that is available can be a little on the pricey side. A lot of the big brands have budget-conscious lines that sell at stores like Target or Walmart. Another reliable place to find deals on compression garments is Amazon. If you want to smooth your silhouette without breaking the bank, here are some of the best budget brands in shapewear and where to find them. 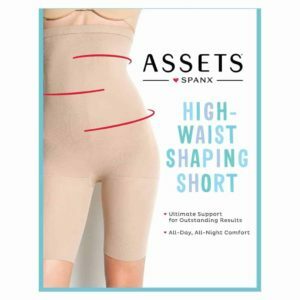 You already know about Spanx, but if you are looking for shapewear that is a little more budget friendly, you should check Spanx Assets. Assets is a more affordable version of Spanx that sells at Target, JC Penney and Amazon. The material and the level of shaping isn’t quite as good, because the fabric that the Asset line uses is a little thinner than the regular Spanx line. They are sometimes sold under the name Assets Red Hot Label, I think the difference is just where they are sold (although not 100 % sure on that). They are well worth considering since some items are as much as half the price of similar Spanx styles. 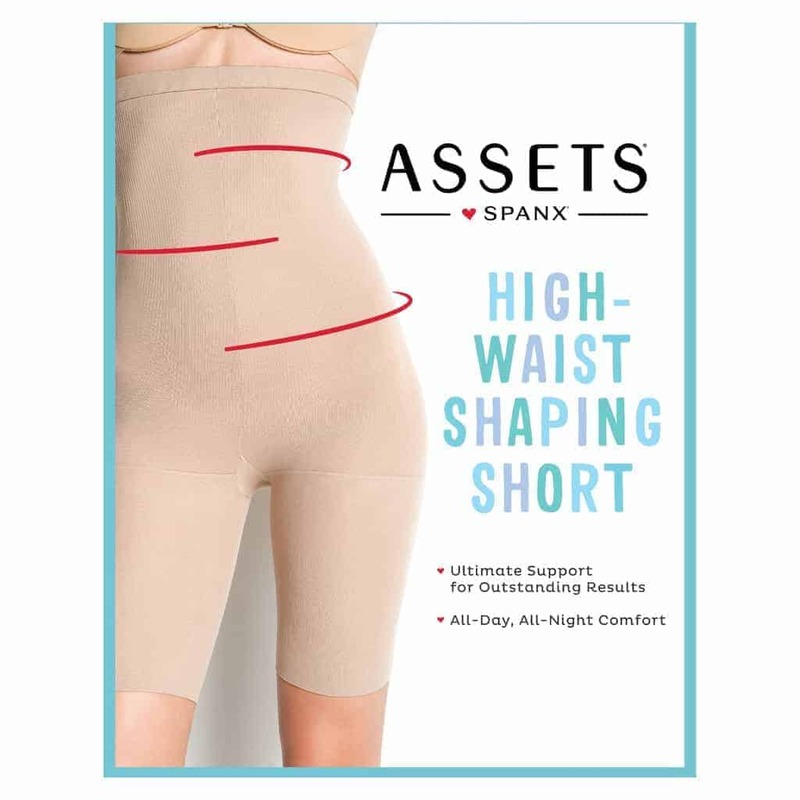 Although if you have worn Spanx in the past and try Assets, you will find that the construction and the fit will be different. Most Spanx regular line garments use nylon, Lycra, Spandex, and elastic. While Assets use nylon and cotton, so they aren’t as heavy duty as Spanx, but some women may find them more breathable and comfortable for everyday wear. Flexees are one of the most popular and effective lines of affordable shapewear. They are a line from Maidenform that has all of Maidenform’s high quality but at more affordable prices than some of the other Maidenform options. For the most part, Flexees come in a firm or ultra firm level of support and control, that will hold everything in without being uncomfortable or restrictive. The Flexees garments are generally known for being comfortable and easy to get on and off, which can sometimes be an issue with some of the brands that offer firm or ultra firm support. A lot of women find Flexees comparable to Spanx, or in some cases, they even prefer them as they are so much cheaper. 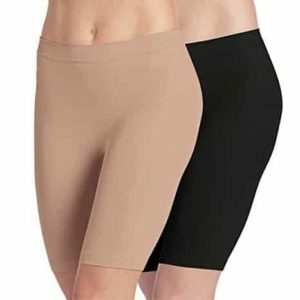 They are a great option if you are just getting into shapewear and you don’t want to spend a lot of money, but want shapewear that will give you outstanding support. Rago is not insanely cheap at first glance, but for the quality and type of product you are getting, they are well priced. Rago’s products are made in the USA and are more of a girdle or corset based take on shapewear so if you are looking for something a little more unique Rago may be the way to go. Rago has been making shapewear for over 65 years, so they are specialists at making comfortable shaping garments that are really strong and quite pretty. They have a much different look than the more basic designs that are popular today. The level of support is usually firm to ultra firm, and they have a lot of great sizing for curves. Jockey is one of the oldest and best-known U.S. underwear manufacturers. At some point, almost everyone has probably owned a pair of Jockey underwear, t-shirts or sleepwear. The Jockey line of shapewear is relatively new and is considered more of a lightweight type of shapewear. They don’t do heavy duty shaping but offer more of a smoothing kind of effect. Because they aren’t as thick and constricting as some products, they are great for everyday wear because they are very comfortable and breathable. They are light enough that you can even wear them comfortably in the summer. A brand that is very affordable and has an excellent reputation for making lightweight, smoothing shapewear is Sunzel. Most of the Sunzel pieces are not an ultra firm fit more of a thin material that will smooth everything out. They offer a very popular body briefer that is comfortable and is suitable for everyday wear. Women love the Sunzel bodysuit since it has a pretty design and is easy to get on and off. It also has wide straps that won’t dig in that helps add to the comfort level. Depending on where you buy it, the price for Bali shapewear can be very reasonable. Bali is a brand that is generally known for quality and comfort and has been around for a very long time. They have a few different collections of shapewear with varying levels of control and unique design features. Lace N Smooth is one of their most popular lines with the best selling Lace ‘N Smooth Body Briefer that people love because the stretch lace feels light and soft and is very breathable. You can also get Bali styles by control levels including Light Control, Firm Control, and Ultra Firm. Light control would be good for everyday wear, while Ultra Firm is what you would get if you are looking for a garment for a special occasion that you will only be wearing for a limited amount of time. They also have a line called Cool Comfort, which is great for warmer months or for those of us who tend to overheat in traditional control garments. Most of their shapewear is well constructed and retains its shape well. Available from Amazon and most major department stores.